Turkey's leaders ... are probably the loudest supporters of the Palestinian cause in world politics today. Turkey's leaders, President Recep Tayyip Erdogan and Prime Minister Ahmet Davutoglu, are probably the loudest supporters of the Palestinian cause in world politics today. Only one flag, other than the Turkish, is sported at their party's election rallies: that of "Palestine." It was because of the "Palestinian case" that Erdogan and Davutoglu premeditatedly chose to move from friendly relations with Israel to a "cold war." Votes and ideological satisfaction followed. But the Turkish rhetoric on "solidarity with our Palestinian brothers" often seems askew to how solidarity should be. In 2012, the Turks' "Palestinian brothers" sounded an alarm when they found out that they were incapable of paying salaries to 160,000 government employees on time. The shortfall was considered the biggest crisis in Palestinian history, and the authorities said they heavily relied on the availability of Arab and international aid. Davutoglu, then foreign minister, said of the "Mavi Marmara" incident -- the raid by the Israeli Defense Forces on the Turkish flotilla that killed 10 pro-Palestine activists who wanted to "break the naval siege of Gaza" -- that it was "Turkey's 9/11." He further said that more Turkish-led flotillas would be on their way to break the Israeli blockade of Gaza, that Turkish military planes and ships would protect these "aid vessels," and that "Israel would eventually be entirely isolated." That was when Erdogan and Davutoglu often boasted that "We are the world's 17th biggest economy and we are running fast to become one of the top 10." Yet, at an international donors' conference for Gaza in March 2009, the Turkish pledges stood at a mere $93 million. That pledge accounted for only 2.1% of all international pledges made there, which totaled $4.257 billion. As of 2012, of all 216 approved projects for Gaza, 180 were run by international aid organizations, three by the World Bank, three by the Red Crescent, 13 by Germany, two by France, and one by each of Belgium, Egypt, Holland and Sweden. Turkish projects? Zero. In 2010, the Turks purchased $270,000 worth of Palestinian goods – 0.00000033 percent of the Turkish economy. 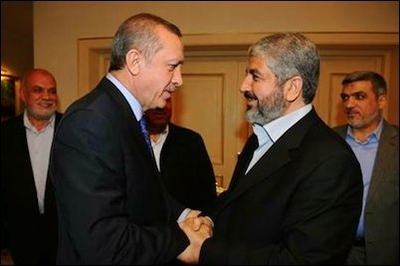 Hamas's loudest cheerleaders remain Messrs Erdogan and Davutoglu. But their government had to keep a low profile at the donor conference for the reconstruction of the Gaza Strip, hosted by Egypt on Oct. 12, with only a general director from the Foreign Ministry participating. It seems Turkey has had a "feud" with Egypt ever since the ousting of the Muslim Brotherhood leadership in Cairo in 2013. At the UN General Assembly in September, Erdogan questioned "whether the global summit was a place where those who 'plot coups' are allowed to speak," slamming Egyptian President Abdel-Fattah El-Sisi's appearance. His comments prompted Egypt's Foreign Minister, Sameh Shukri, to cancel a planned meeting with Turkey's Foreign Minister, Mevlut Cavusoglu, on the sidelines of the General Assembly. Instead of sending its foreign minister, Turkey sent to Cairo the ministry's director general for the Middle East and North Africa, Can Dizdar. Speaking at the conference, Dizdar revealed how generous is the world's 17th biggest economy and the staunchest benefactor of the Palestinians: $32 million for Gaza had been collected in Turkey for humanitarian aid, including fuel, electricity, power generators and relief equipment. Thirty-two million dollars makes up 0.00004% of the world's 17th biggest economy. At the donor conference, Qatar, Turkey's only ally in the region -- its pro-Hamas, pro-Muslim Brotherhood, Islamist brother -- pledged $1 billion for the reconstruction of Gaza. Tiny Gulf states Kuwait and the United Arab Emirates each pledged $200 million. And so did Turkey, Hamas's savior and loudest cheerleader -- over a period of four years (2014-2017). This makes $50 million annually, or 0.00006% of its economy. That is a generous gift to Hamas, with love from the Crescent and Star.